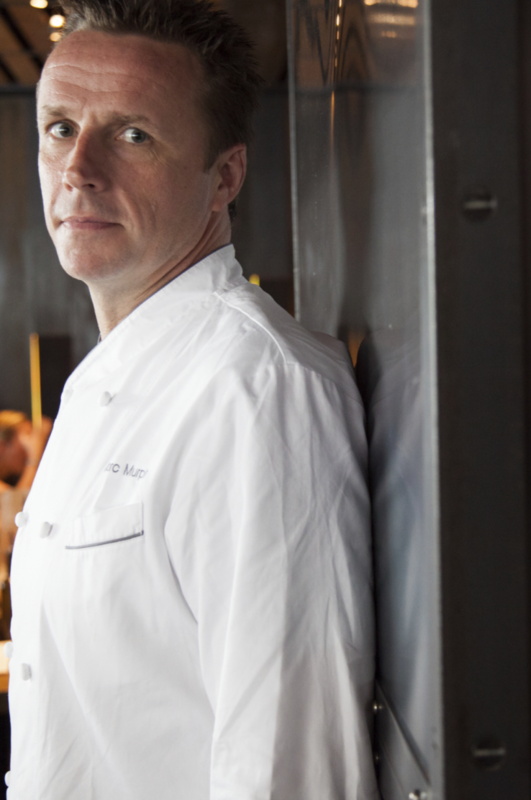 After falling in love with French and Italian cuisine during his childhood spent living in Europe, Chef Marc Murphy went on to work in some of the most highly regarded restaurants in the world from Paris to Monte Carlo. Today he’s one of New York’s most highly respected chefs at the helm of his restaurants Landmarc, Ditch Plains, and Kingside at the Viceroy Central Park. The gastronome’s work in the industry now includes a regular role as a judge on the Food Network’s Chopped. In our conversation with the chef we got some insight on what it’s like to be in one of his kitchens and a few suggestions on what to order when you come in for a visit this month. First, let’s get a sense of what it’s like to be in one of your kitchens. What three adjectives would you use to describe the energy and atmosphere? I think we try to keep it fun. Obviously, a proper work space. We all have to get the job done. Also, I think celebrating the product that’s being used and being respectful with it. That’s, I think, a very important thing and in the food that I like to deal with I don’t want to over manipulate it. I like to let the food do the talking. You opened Landmarc in Tribeca more than a decade ago. What initiatives do you put forth to keep things fresh for diners? Landmarc is really a neighborhood bistro, so it’s a lot about consistency of product, consistency of dishes. I feel as though a neighborhood bistro, if you do want to go there, you probably already know what you want before you get there. So we do have to have very consistent and good quality dishes. As far as sprucing it up, I work with chefs with each one of my restaurants and we like to highlight more seasonal products. We used to do different flatbreads all the time. We do a fish of the day and things like that. That’s where the creativity has to be brought in. In a bistro, you have to have the steaks and you have to have the classic sauces and certain things like that. You can’t always be changing the menu all the time in that type of a restaurant. For example, we’ve had the same dessert board since we opened up. I tried to change it once and it was like a revolution. People started yelling at me. You recently launched a late-night menu at Landmarc. What was some of the inspiration for the idea and how did you develop the menu? The inspiration for that was we started working with this beer app called BeerMenus. People that really like beer follow and they see these specialized beers and limited beers that are being offered. They see it and they go, “Oh wow, let’s go there.” That’s one reason we did it. We wanted to start working with some more local and smaller beer companies. Get those beers highlighted because we’re all about great stuff. We wanted things to go with beer. This year you’re celebrating the 10th anniversary of another one of your NYC restaurants, Ditch Plains, inspired by the legendary Montauk surf spot. If we’re coming in on a brisk October night, what should we order to remind us of warm summer days out East? We have a great lineup of tacos. We have had a great lobster roll on that menu since we opened. 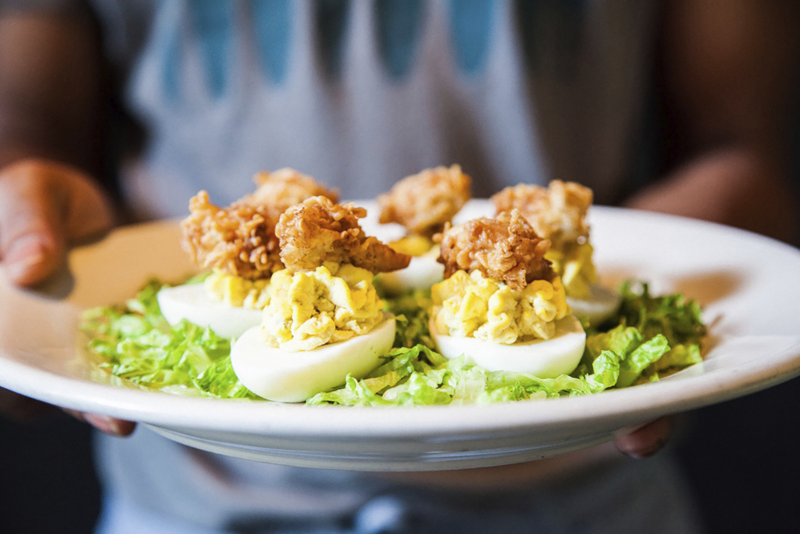 One of my other favorites is the deviled eggs with fried shrimp or fried oysters on top. And of course, a backyard burger. It’s a regular burger like you would get if you’re at home. It’s the perfect pairing with a pint. Of course, one other dish that people go crazy for is the Ditch Dog. That’s a hot dog and it’s smothered in mac ‘n cheese. What about your newest post, Kingside at the at the Viceroy Central Park? If we wanted to embrace the season what would you suggest? That is a restaurant that we call New American. We get a little more eclectic there. We change the menu there about every two or three months. We really stay very, very seasonal there. We try to do a little bit more inventive things. Last season we had a beef tartar on the menu, we have an amazing kale salad. Of course, the whole chicken for two is always a big fan favorite. When you were first approached to host the Food Network’s Chopped were you at all hesitant? What’s the next challenge you’re looking to take on? For me, being approached to do Chopped, it was an honor and I loved it. We all love. It’s great and we all work together. We’re all great friends, all the judges and so it’s always been a great time. New challenges, I’m not really sure what’s next. We’re still poking around, seeing what else is out there. I think one of the main things I like to do is always try to promote good eating and trying to make everybody understand food and love food and respect food. I think it’s one of those things that every chef should be dealing with or spearheading.